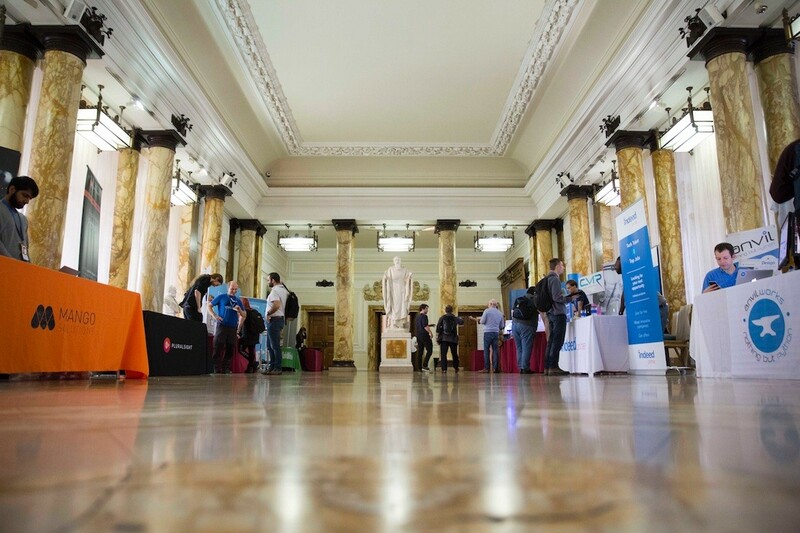 Sponsoring PyCon UK is a great way for your company to support the Python community, promote your products to more than seven hundred delegates, and meet Python developers who are looking for work. We couldn't run the conference without the generous support of our sponsors. In return, we will ensure that your company is given exposure before, during, and after the conference, and we will work with you so that you get exactly what you're looking for out of sponsoring the conference. We will promote sponsors before the conference through social media and in the UK Python News newsletter. In addition, your logo will be placed on the conference website and on signs around the conference venue. Sponsors receive free tickets for the duration of the conference. For Silver and higher levels, your company will be able to set up a booth in the central Marble Hall to allow you to interact with attendees for the duration of the conference. We run a jobs fair over the Sunday lunchtime, allowing sponsors to meet conference attendees who are (or expect to be soon) looking for work. There will be only one Headline sponsor, with the biggest presence at the event. This is an ideal opportunity to put yourself centre-stage in front of our 700+ audience. We'll discuss and agree terms of the sponsorship package with you in detail to create something that really works for you. For each of the options below, you'll be prominently associated with the service you're sponsoring, and able to place your publicity materials such as banners and logos in appropriate places. You'll also have free access to the jobs poster board in the Marble Hall. PyCon UK will once again host a Django Girls workshop, offering 60 women beginners the opportunity to learn how to create a web application and find out about the Python UK community. Over the five days of the conference, our 700 attendees will have several lunches each. PyCon UK attendees will consume about ten thousand cups of tea and coffee and eat a similar number of Welsh cakes. Every talk in the main auditorium will be supported by our speech-to-text service, providing live captions on a number of screens in the room. PyCon UK provides a free crèche, for the benefit of attendees who would otherwise be unable to attend due to childcare cost or commitments. The large screen, the PA system and lighting in the main auditorium - as enjoyed by all of our attendees. The professional conference photographer will be present for all five days and will create a lasting record of the event. Each evening after the conference there will be Python-related social events at the venue - a quiz, a Python music night and more. Last year these sessions were packed. Support the lanyards and our collectors-item badges, and every single attendee will wear your name and logo. We'd be delighted to have you as part of our event. If you'd like to know more, just get in touch.